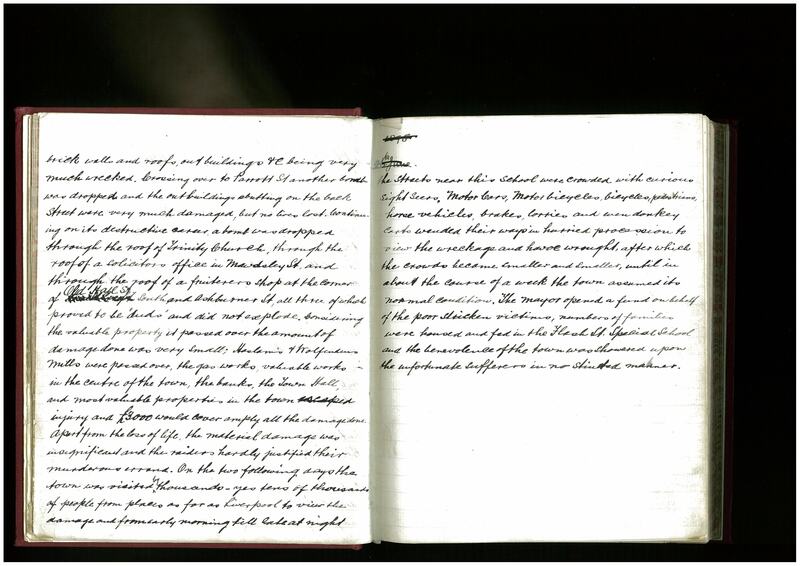 Margaret Koppens, a volunteer at Bolton Museum and Archive, has written this story of the threat posed to Bolton by a Zeppelin during the Great War. During the First World War thousands of men from Bolton and elsewhere were sent to fight the war in France which in those days must have seemed a long way from home. But on the night of the 25th September 1916 the war came to Bolton in the form of bombs and incendiaries dropped from a L21 German Air Ship, known as a ‘Zeppelin’. When the story was reported in the press some days later, the exact location of the raid was not given due to censorship restrictions; instead it was reported as ‘a town in the north Midlands’. It was at the end of the war in September 1918 when the full story was told in the Bolton Journal & Guardian. The Zeppelin having caused damage at Ramsbottom and Holcombe came into Bolton over Astley Bridge dropping the first bomb near to the Eden Orphanage, from here he travelled over Halliwell and Chorley Old Road, missing the cotton mills but dropping bombs and incendiaries, one of which demolished the end house of Lodge Vale, near the Mortfield Bleachworks. He then turned his attention to the Deane Road area missing the four large gasometers and the railway sidings but dropping an incendiary which set fire to stables in Wellington Yard. 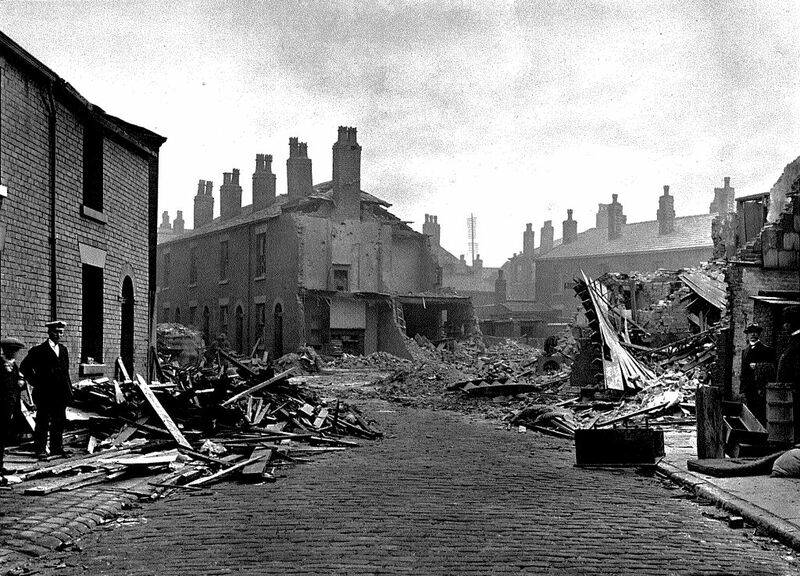 It was Kirk Street which ran between Deane Road and Derby Street which suffered the most damage with six houses being destroyed and 13 people killed and nine seriously injured; in all 19 families were rendered homeless. After dropping more bombs in Bolton town centre the L21 was last seen heading north towards Blackburn. 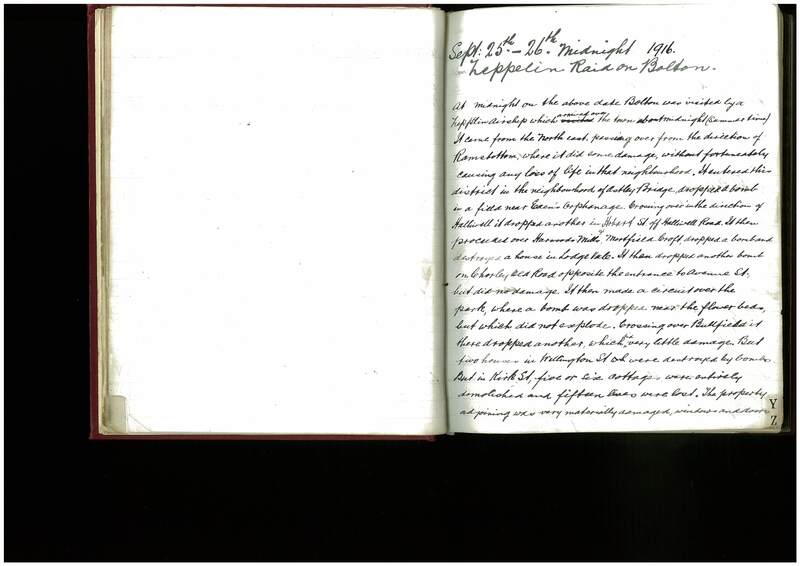 An entry in the Log Book of Derby Street School for 26th September 1916 records 60 children absent and the register not marked followed by the following comment “…the calmness and absence of abnormality on the part of the poor children whose homes had been destroyed was a wonderful witness to their ability to undergo emergencies.” In the front of the Log Book is written a full account of the raid and the thousands of people who came from as far away as Liverpool from early morning until late at night and by all means of transport to view the “wreckage and havoc wrought”. 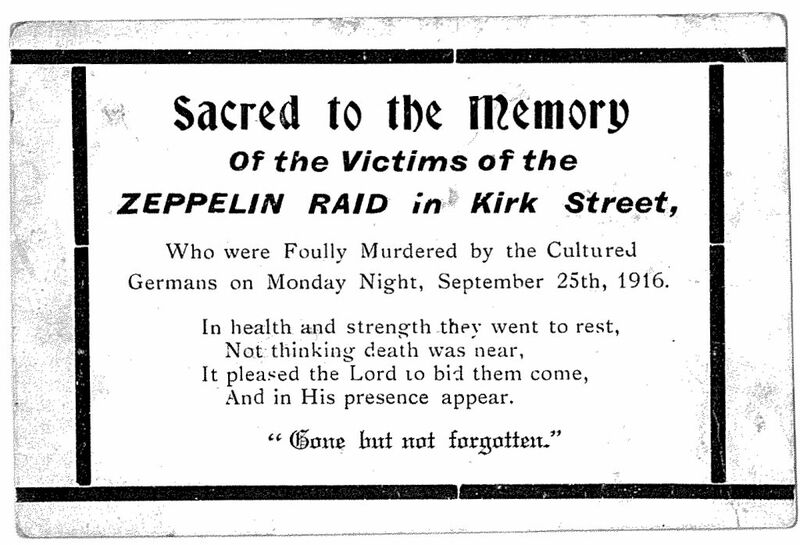 ‘In Memorium’ Cards were printed by a local printer which were sold to provide funds for the people of Kirk Street who had suffered in the bombing. 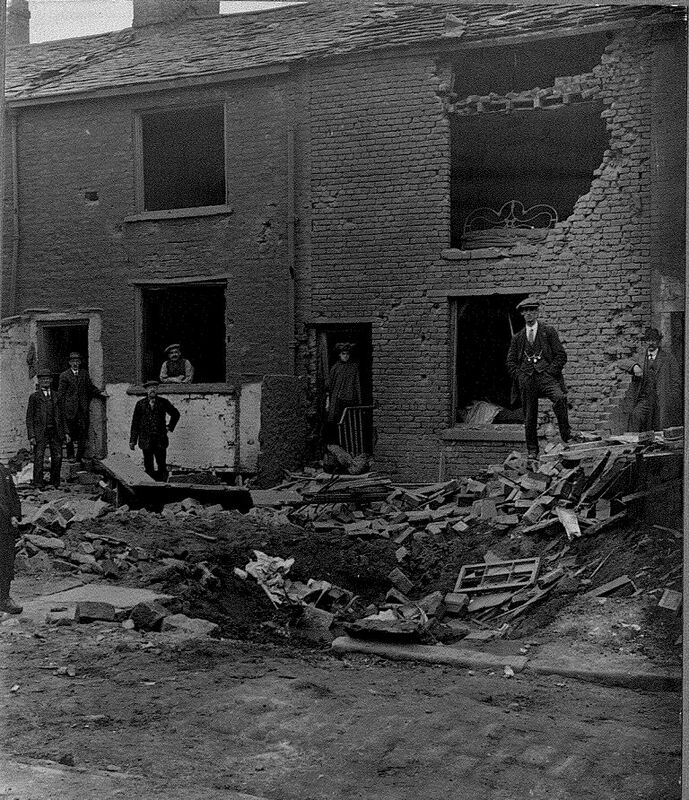 Zeppelin Raid: 25th September 1916. My late Mother Ada Stopforth (nee Martin), was born in 1907. She was 9 when the Zeppelin bombed Bolton. The family lived at that time in Cross Street, Little Bolton. She recalled the Zeppelin having a distinct loud droning noise and being quite low over the houses as she looked through a bedroom window.